Can I connect any power supply to my TauRIS system? Only use a power supply authorised by us! We are not the manufacturer of our power supplies. Instead, we made a thorough analysis of the market, shortlisted the technically superior models and subjected them to comprehensive testing regarding their suitability and quality. These tests specifically included their supply of power to our TauRIS systems. We then chose the power supply with the best performance and incorporated it in our product range. Thus, and only thus, are we able to guarantee the durability of your system and adequate operation of your sensors. Can I connect my new terminal to my old sensors? 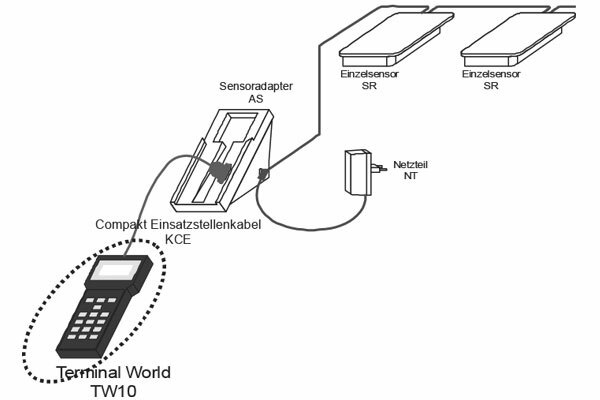 Using the KCE01 Club cable, you can connect your new TauRIS compakt XL or TauRIS WORLD terminal to your existing sensor adapter without any problems. See Fig. above: simply plug the cable into your terminal and existing sensor adapter. This cable can also be used to connect up to the Club adapter if it does not already have a cable. How do I activate my terminal after a race? Please ensure that you have entered your user codeword. Please ensure that you have printed out the clocking list for the release point you wish to activate. If the terminal can still not be activated, try entering 0000 and then confirm. The terminal then requests a new codeword. Now enter the correct codeword. Only use real numbers and not 0000 – this does not count as a codeword! We generally recommend using 1111 as the codeword in order to avoid typing errors. If this still does not help, please call us. We will be happy to help you! How many sensors can I operate with one NT12 TauRIS power supply? An NT12 TauRIS power supply can power 6 single sensors or 4 quadruple sensors with an overall cable length of 30 m.
Using a TauRIS Power Feeder and an additional NT12 TauRIS power supply, the system can be extended by the same capacity again. How often does my terminal need to be serviced? How can I tell it is time for a service? Your TauRIS terminal contains an internal lithium battery which needs to be replaced by us at regular intervals, within the framework of a normal service. 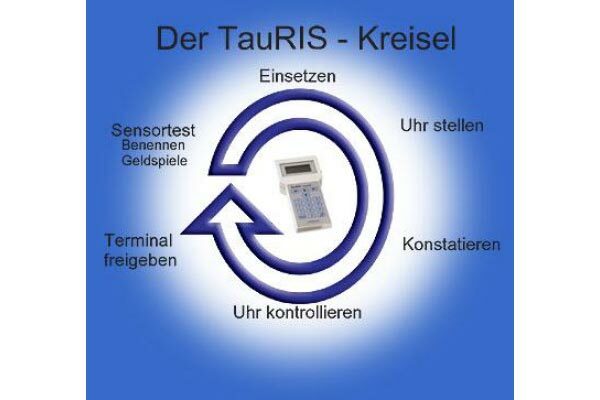 A normal service also includes a complete performance control of your TauRIS terminal. You can see when it last had a service by turning it over and looking at the round „TÜV“ sticker on the back. The number inside the circle tells you the year. For guaranteed trouble-free enjoyment of your TauRIS terminal during the race season, we recommend a service every 3-5 years. You can give us your terminal for servicing by handing it in at the TauRIS booth during any fair or by sending it directly to your TauRIS dealer. If you choose the latter option, please note the cheaper postage costs if you make a collective shipment via your Club. I cannot enter any nominations. What can I do? Please ensure that all training flights have been deleted. To do this, press keys [Start] -Training in the main menu. Please wait until the sensor number is displayed. Then press  in order to delete the training data. I cannot enter any pigeons for release point X (Version TS-D 9.00). What can I do? In the TS-D 9.00 software for our TauRIS compakt XL and TauRIS WORLD terminals, release points and races can be activated individually. This means that individual release points or races could still be obstructed if you have not yet reactivated them. Please ensure that the release point you wish to use has been activated. Where can I find the release point numbers or the release points I have used? In the main menu, press key -view. Scroll through the clocked pigeons. The release point number is displayed in brackets in the last line and on the left.